Lightweight, pocket-sized, all-plastic Knee Defender™ is easy to use – helping you gain some protection for your knees when there is no airplane legroom space to spare but you may be dealing with an aggressive seat recliner. Knee Defender™ includes a pair of identical components which you use to help protect yourself by limiting how much the seat in front of you can be reclined. 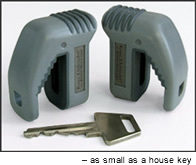 Below are pictures showing how Knee Defender™ is used. First, place one component of the Knee Defender™ on each arm of your lowered tray table – at the top of the arm, near where the arm is attached to the table. Each component simply straddles the tray table's arm. Then, slide both Knee Defender™ components down the arms of the tray table until they are snug against the seatback in front of you. Knee Defender™ is now in place. If the person in front of you attempts to recline, your Knee Defender™ will take the hit. Whether you are intent on protecting yourself from being crunched, want to maintain enough leg room to do some in-seat exercises because of health concerns – such as Deep Vein Thrombosis (DVT), sometimes called "economy class syndrome" – or you just want some warning so you can move your notebook computer out of the way before the seat is reclined, Knee Defender™ works "like a charm." Knee Defender™ is adjustable. In general, the closer the two components of the Knee Defender™ are to the seatback, the less the seat back will be able to recline. 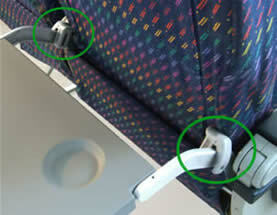 If you need to prevent as much reclining as possible, then you would slide them fully up against the seatback. On the other hand, if there is enough room for the person in front of you to recline partially – safely, without threatening injury to you – the Knee Defender's components can often be set slightly away from the seatback to allow some reclining. Knee Defender™, with its specially shaped grooves, was designed to work with a wide variety of seat and tray table styles. However, not every style could be accommodated, especially those used on some commuter planes and even on some jets. For additional information about this and other questions about using Knee Defender™, click here to link directly to our related FAQ page. Consider making use of the "Courtesy Card"™, at right, when you use Knee Defender™. You may print it out, fill it in, and present it as a courtesy to the passenger sitting directly in front of you.